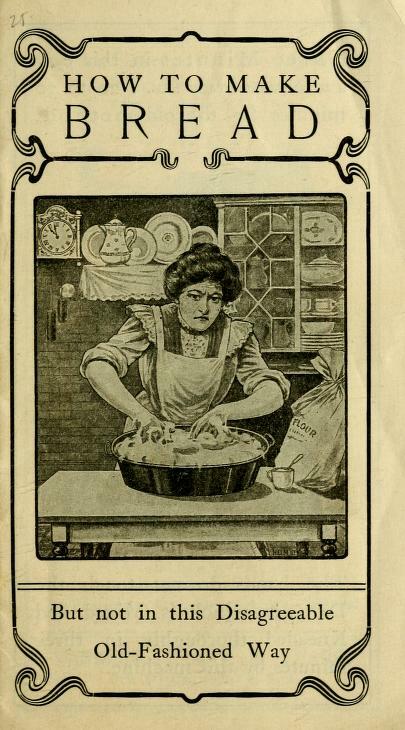 The Old Foodie: The Universal Three Minute Bread Maker (1900). Domestic homemakers and cooks are always in search of ways to save time and mess in the kitchen, and over the centuries inventors have come up with a multitude of devices – some more practical than others – to assist them to do so. 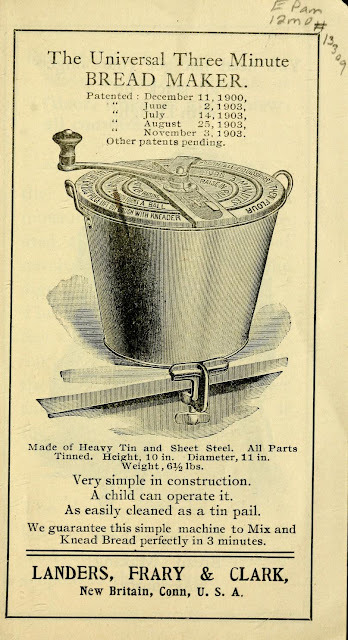 On December 11, 19o0, Messrs. Landers, Frary & Clark, of New Britain, Connecticut, U.S.A. were granted a patent for a ‘Universal Three Minute Bread Maker.’ Naturally they published promotional pamphlets for their machine (complete with recipes,) and equally naturally, as soon as I came across it I felt I had to share some of its contents with you. The pamphlet is dated 1910. But not in this Disagreeable Old-Fashioned Way. Three Minutes in this easy and pleasant way .... 20 to 30 minutes by the old method. The hands do not touch the Dough, which is Mixed and Kneaded thoroughly in three minutes by this machine. You need not get your fingers "all stuck up" with Dough or worry about Bread Making any more. The "Universal" Three Minute Bread Maker is mixer, Kneader and Raiser, all combined. the action is such that the moisture is thoroughly distributed, allowing every particle of starch to expand and become digestible. The kneading is done in a perfect and scientific manner, thoroughly and evenly mixing all the ingredients, so that better and more wholesome bread is the result than in the old way. The dough, after kneading, is left to rise in the pail, which with its cover, is peculiarly adapted to this purpose. Use your own recipe, but be sure to use One Quart of Liquid to Three Quarts of Sifted Flour, measured accurately. Put in all liquids first. This is absolutely necessary. Then put in all the flour. Turn the crank three minutes. This kneads the dough into a compact ball. Put on the cover and set the complete machine in a warm place for the bread to rise. After raising run a knife around the edge of the dough to separate it from the pail. Turn the crank a few times till the dough forms a ball around the kneader. Then loosen the binding lever of the cross piece, lift the dough out of the pail by taking off the cross piece and raise the whole out of the pail, push dough off kneading rod, cut up and put into baking pans. DO YOU BUY BAKER'S BREAD? A barrel of flour makes 300 loaves, and costs at the Baker's 5 cents per loaf, or $15.00. You save $9.00 every time you use up a barrel of flour, if you make your own bread. Make your own Bread and save money. Good Home Made Bread has no equal, and it is made perfectly in 3 minutes by this simple machine. One quart of liquid to three quarts of sifted flour is as near as you can make a general rule. All the liquids should be put in first, all the flour afterwards. Note, however, that some flours require more liquid than others, and two or three trials will show the housewife what slight variation, if any, from these proportions is necessary to accommodate the kind of flour she uses. The machine is large enough to allow four loaves of bread to raise in the pail. To make four loaves, put into the Bread Maker one quart of liquids, in which have been dissolved the butter, yeast, etc., as desired, and last of all, add three quarts of flour. If the dough is too stiff, add a little water, and if too soft, a little more flour. … When Milk is used it is always understood that it is to be scalded and allowed to cool before it is added to the yeast. All flour is to be sifted and measured after sifting. Into your quart measure put one compressed yeast cake, crumbled up, one tablespoon sugar, one tablespoon salt, two tablespoonsful melted lard or butter, fill measure with lukewarm water and turn into Bread Maker. Lastly, add three quarts flour. I always wondered when this was patented. My mother used one for years, making our bread. The precursor, I suppose, of the bread hook on my stand mixer. Gives a loaf with excellent texture. So a KitchenAide mixer with dough hook is just an electric-powered version of this human-powered machine, right? It looks familiar, though. I may have seen one at an antique fair/flea market once, but it was probably too expensive.